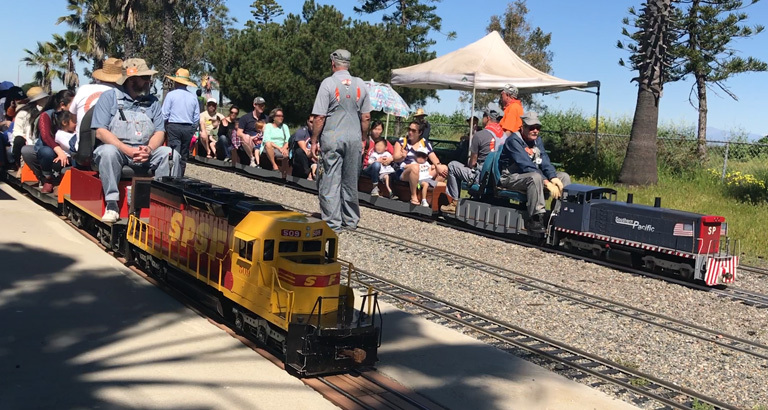 The Orange County Model Engineers (OCME) have been giving FREE rides to train enthusiasts young and old for almost 30 years. I want to call the OCME Orange County’s best-hidden gem for kids, but it turns out once we started recommending it to our friends with kids they already knew about it! I guess you don’t know specific things like mini railroads with trains for toddlers existed until you have kids of your own. 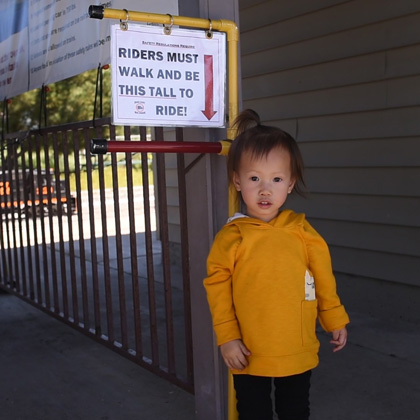 Trang initially heard about the OCME six months ago, but Kairi was too short to ride the trains at the time. Kairi finally hit the minimum riding height (31 inches), just in time to take advantage of March’s free ride weekend. Freeride weekends are only open to the public every third weekend of the month so be sure to mark your calendars. We were thoroughly impressed with the Orange County Model Engineers club during our visit. We arrived around 11, and the large parking lot was already filled. Which had us fearing a long line. But to the OCME’s credit, the lines weren’t a problem at all. The constant flow of trains had the line moving at a quick clip. I’ll have to admit, once I was sitting on the train with Kairi in front of me I was more excited than her for the train to get going. After a short safety declaration, we were off on a 5 to 10-minute stroll down the tracks. The ride had us making two alternating loops around the property and Kairi had a ball. After the initial train ride, we grabbed an open picnic table and ate a small picnic lunch with friends. Once we were done, we got back in line for round 2. We got there expecting to stay for maybe 20 minutes but ended up staying for well over an hour. On our way out we gave a small donation to help keep the “Free train ride weekend” available to the public. Established in 1985 the Model Engineers are an all-volunteer club. 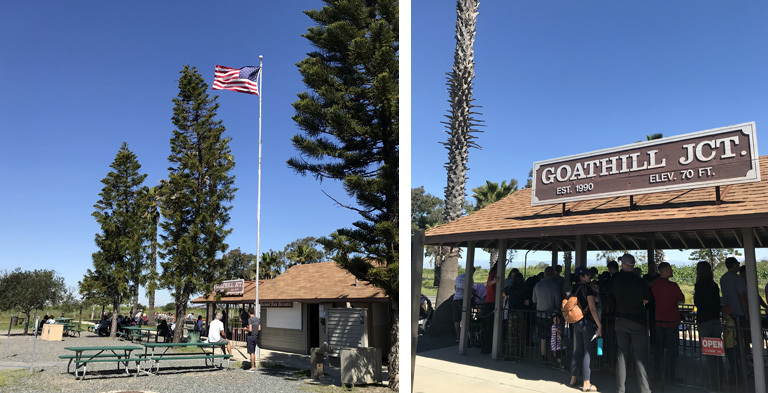 Together they operate the Mackerel Flats and Goat Hill Junction Railroad located in Fairview Park in the City of Costa Mesa. A place where anybody interested in trains can come to learn and build a train of their own to ride on over 5 miles of track! At ⅛ scale, these trains work precisely like the life-size ones. Memberships are available that provide access to the tracks and workshop throughout the month. For more information check out OCME’s official website and social media pages. YES. It’s free(ish), it doesn’t get much better! The OCME is an outstanding place to bring your children in Orange County. At ⅛ scale, it’s like somebody knew these are perfectly sized trains for toddlers. You should go. Invite your friends with kids and make a lunch get together out of it. I know we’ll be going back again in the future. Food for a picnic – How could you not with so many picnic tables! Some cash – While riding the trains is technically free donations go a long way to ensure that the trains continue to be free every third weekend of the month. Looking for more things to do with your kids? Check out our post on the ZooMars Petting Zoo in San Juan Capistrano. It’s not free, but it is an excellent place for kids to interact with animal animals. 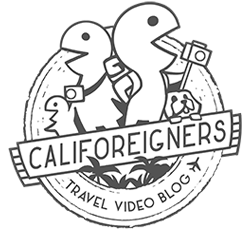 We got another post in the pipeline for Newport Beach coming soon so be sure to come back! If you found our post helpful and want to hear more from us in the future, please consider signing up for our Monthly Newsletter. We promise to send you the most basic, to the point text newsletter you’ve ever seen! Thanks in advance for the support, it’s much appreciated.